Your party photo booth hire is entirely yours to control as there are no set packages, you create your own. Simply choose your booth, select how many hours to hire and include any additional extras to enhance your photo booth experience. Your party gives you the perfect opportunity to get creative and express yourself. Odd Box offer a range of quirky and entirely unique booths so you can hire a photo booth that matches the style of your event. Perfect for all venues in Glasgow, Edinburgh, Dundee and across Scotland your Odd Box booth is guaranteed to create instant entertainment for your guests while providing that extra wow factor at your party. 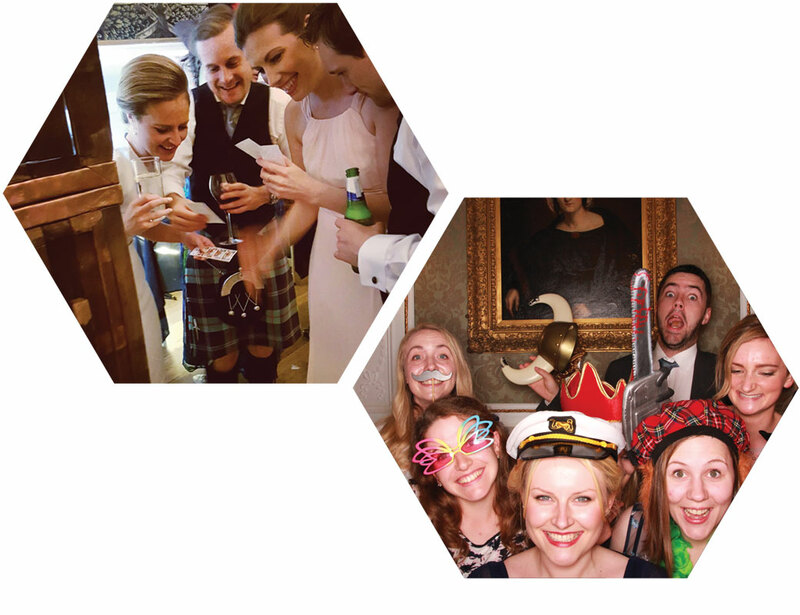 Your party will need to entertain all of your family and friends, so why do Odd Box think we are one of the best party photo booth hire experiences in Scotland? Odd Box Booths are entirely unique and stylish, designed and made in Scotland using locally sourced materials allowing you to hire a photo booth that will look amazing at your party. The party photo booth experience is the perfect highlight to an unforgettable day. This allows you to capture instant memories of your loved ones while providing them with a perfect keepsake to cherish. 2 - Turn your hire into a story with your own party guest book where guests leave a copy of their prints and a lovely personal message. 3 - Use your venue as the backdrop to capture it's beauty and create a unique party photo booth scene. 4 - Customise your party photo booth prints and guest book to match the style or theme of your party. 5 - For a party with between 80 - 150 guests normally a 2 to 3 hour hire would be perfectly OK, extra hours and odd hours are available. All party photo booth hires in Scotland include unlimited photo booth sessions, instant prints, free props box with a huge variety of props, our lovely photo booth attendants and a free online gallery where you can purchase larger prints and download your images after your party. To view our prices, learn more about the photo booth hire experience and discover how you can book your party photo booth take a look at our photo booth hire prices page.